Open world games are becoming dominant in the video game industry. Is this good, or is a backlash coming that could threaten the sub-genre’s existence? Open World – this is emerging as the dominant sub-genre of this generation. Whether action game, RPG, or even racing games, open world is currently the way to do things, especially in the AAA sector. It’s a natural evolution of the now-dominant western approach to gaming, which always focused on freedom of choice and movement rather than fundamentally simple experiences. However, there is a fundamental problem with the widespread adoption of the open world sub-genre – over-saturation. Too many similar games on the market all at once threaten to make these games less of an exciting opportunity to relax and more of a mundane slog, which we’ve all done a hundred times. This is paired with a a huge lack of innovation in the genre, and we have a problem that may manifest itself in a big way down the road. 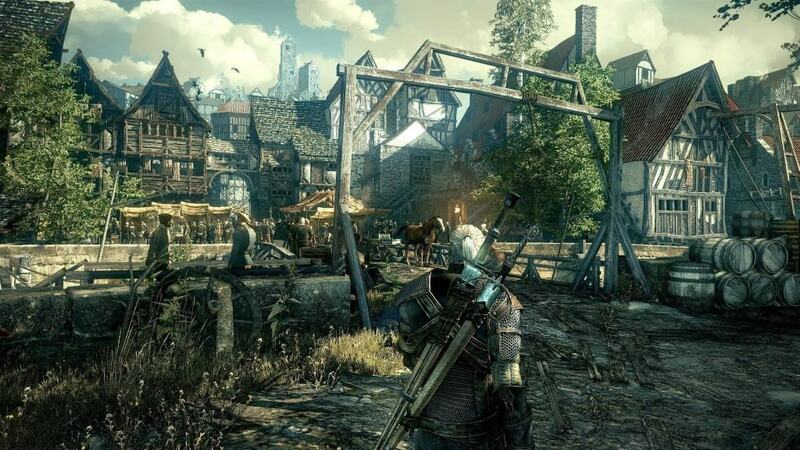 As a sub-genre, open world can apply rather widely to different genres in the industry. For the purpose of this article, I’m mostly talking about the sandbox-style game, which makes up the bulk of the open world experience. The prototypical sandbox game is Grand Theft Auto, which makes sense because many attribute to the creation of the modern variant sub-genre totally to Grand Theft Auto 3, though the truth of the matter is that it had roots in western RPGs. The reason it’s called ‘sandbox’ is because the point of the game is to give gamers a huge place to play in and set them free. Imagination and creativity takes over from there. For example, I remember spending hours with a friend on Grand Theft Auto: Vice City trying to jump out of a helicopter and land in a boat in the water (we succeeded by the way). It was stupid, but that’s the kind of charm of sandbox games. Sure there are often missions available, and stuff to do, but the key element to any such game is player-driven exploration. This applies equally to Skyrim and its caves full of loot and Infamous: Second Son where you just want to get to the tallest building around. As mentioned above, open world games have become the hot item nowadays. It’s actually uncommon to see a major game that isn’t open world, and old franchises are accommodating the trend as best they can. Look at the upcoming Batman: Arkham Knight, the original Arkham Asylum was a tight experience with only a few open deviations to the main narrative, now Arkham City, and Arkham Knight have evoked the series into a predominantly open world one. So too are older franchises making the move. The upcoming Zelda for the Wii U is pushing its open worldedness as much as Nintendo can in promotion. True, the original Legend of Zelda was in fact an open world game, but the promotional material from this new Zelda is clearly trying to evoke the scale and feel of games such as Skyrim. To put it lightly, we are not even close to seeing the end of open world dominance. It’s the big gimmick of AAA-developed games this generation. They cannot compete with indies for innovation, but they have the budget to build something huge, something people haven’t seen before. The budget, something that causes AAA developers to play it too safe, is also their one big trump card and it allows them to build such huge worlds. Problematically, everyone seems to have keyed on this and are pumping out open world games as if being open world is a strange feature that we’ve never seen before. It’s not hard to blame them. Open world only fully took off last generation with only a few smatterings before. AAA development is slow, and publishers are classically reliant on jumping on trends. This isn’t bad, per se. After all, it’s given us some pretty great games recently, like Far Cry 4, but there is a singular problem that could turn this over-stuffing of the market into a death spiral for the sub-genre. What I’m talking about is stagnation through lack of innovation. Open world games, especially of the sandbox variety have experienced near 0% evolution since Grand Theft Auto 3 brought the sub-genre to the mainstream. Ignoring artificial trappings, all open world games are actually extremely limited in scope, perhaps more so than linear games. There are missions, provided by checkpoint markers scattered around town, you are often cut off from the bulk of the world by artificial means until you progress in the story, and most of your time will probably be spent on side missions and collectable hunting, which are all identical. I was recently playing Middle Earth: Shadow of Mordor, killing orcs, grabbing flowers, etc. After a while, I decided to switch over to Far Cry 4, and later Infamous: First Light. Then it hit me – I was playing the exact same game every time. All I was doing in any of these games was exploring pretty much the same world doing pretty much the same tasks. It’s a fundamental problem with open world games. If you create a huge world, you have to find something to populate it, and no developer has enough time to consistently make something interesting around every corner (though Fallout: New Vegas comes close). So, what developers do to fill the space is create a whole slew of random collection quests everywhere. Sometimes there is effort put into them like the Riddler collections in the Arkham games. Most of the time, however, things are as boring as collecting feathers in Assassin’s Creed. The worst part is that this overabundance of mundane events can get in the way of enjoying the sandbox. When I’m focused on collecting everything, my mind is never on the beautiful scenery or thinking about what crazy thing I’ll do next. The upcoming indie open world game No Man’s Sky seems to go the opposite direction. It has a great concept, but I’d be willing to be you there is next to nothing to do in that game. The cities change, but there’s zero difference whether you’re jumping around in Crackdown, stealing cars in Grand Theft Auto, or singing karaoke in Yakuza. The core experience of the open world game has not evolved, and nothing that has been demoed that makes me think anyone is planning to change that in the future. At this point, open world is just another way to extend gameplay time and sink dollars into. Few games actually have fun with the experience, most rely on it as their singular feature. When I think about it, most of the open world games I play nowadays aren’t really enhanced by being open world, and few of them are actually all that fun to play. Take Shadow of Mordor for example. I like this game, but it has terrible Assassin’s Creed controls (due to having taken them from Assassin’s Creed 2). It doesn’t play well, but the Nemesis system and open nature of the game mask that fact. Is that a good thing for consumers, or lazy design? It’s hard to tell; it might be both. The real question that has to be answered is whether or not people are going to get sick of open world games. In my opinion, without massive change to the bare formula, they will. The hard part of changing the formula is that everyone already thinks they are doing it, when the base game remains too similar. People complain about repetition in games like Call of Duty and Mario, but this is an entire sub-genre of clones. Open world is the biggest cut and paste job in the industry, and I don’t think any game in the sub-genre is ever going to have the ‘wow’ factor of Grand Theft Auto 3. It’s the same thing with the MMO genre right now. Everyone has been chasing the World of Warcraft model for so long that it has alienated a large segment of people who are sick of the same thing over and over again. Ubisoft, in particular, is a huge contributor at the moment. Assassin’s Creed, Watch Dogs, and the upcoming The Division are all open world game franchises that provide little to no change in their respective niches (we’ll wait a bit before officially judging The Division) and are flooding the market. What will be interesting to watch is whether there is a push back from all of the open world games we are going to be receiving in the near future. Linear games have become rather gauche in todays gaming, really having lost favour publicly at the launch of Final Fantasy XIII, which was the Marie Antoinette of linear games. Or, maybe I’m wrong and people will demand more open world games, or someone will figure out a way to completely innovate and push the sub-genre to new heights. Either way, the future of gaming will be interesting even if we have to collect another 100 items spread out across a city/fantasy landscape every second game. I personally don’t mind a linear story. I understand the appeal of open world, where I’m essentially playing as myself, and can go goof off if i want to. But there’s something equally fun about getting to play through a story of characters that aren’t supposed to be. Like the Uncharted series. No one complains that that game is too linear. And side note: I’ve said it before, I’ll say it again. I liked FFXIII. The linear approach worked because of the storyline. It doesn’t make sense to be able to spend 40 hours on side quests when the world government is trying to hunt you down. It doesn’t make sense to designate 20 hours to side quests right before the big bad tears a hole in the fabric of time, the fact of the matter is doomsday-adjacent is the best time to go side questing. Yeah, that’s why I try to do most of the side quests early on in the game. Non-pressing ones can wait after the last mission. From my experience quite a few JRPGs like to have the end of the game force into a NG+ or a screen that you then have to reset the game for. There isn’t any “after” the last mission in a few of my adventures. True enough. It’s difficult to strike a balance and not compromise the story you’re wanting to tell, I suppose. They experimented with a much more sandbox approach in the other two after it. And are going back to the much more traditional world exploration in the FFXV if the demo videos are to be believed. Newer technology and traditional roots are finally converging. Then when they converge and succeed the next meeting at enix will probably be ringing with “….well now what”. It is interesting how quality level design used to be such a prized skill and a game’s overall success or failure often rested entirely on good level design or lack thereof. Whereas in open-world games, all the designers need to know how to do is build a city, or in most cases, copy an existing city. Honestly, even in the indie space, level design isn’t really a major focus as so many indie games go the randomly-generated route. It’s a scary thought to think that today’s budding game developers aren’t even bothering to learn to be good level designers since it doesn’t seem like an important or necessary skill to them. All you have to do is play one of the recent 3D Mario games if you have any doubts that there is still a place for creative, well-designed, expertly polished levels. This sub genre has gotten completely out of hand. A linear style approach to gaming can make for a more memorable experience instead of attempting to cram as much “life” into your game as possible. I never felt these games left you with as much freedom as you would like to believe, as you still pretty much run from location to location, talk to person with a glowy thing, run to another location, complete it, then repeat. There’s only so many times that template can be redone before I get lulled to sleep. I have no idea how Dragon Age Inquisition beat Bayonetta 2 (or Shovel Knight) for Game of the Year. Inquisition is a more slightly polished version of the same thing!! Then series that has no business attempting open world style (Lords of Shadow 2) are so misguided because they were so wrapped up in emulating what’s popular that they didn’t even include the elements that make people play them in the first place!! Outside of the first Legend of Zelda and my brief romp through Dark Souls, I have never cared for these kinds of games. My little brother is all jazzed for Witcher 3, and I’m wondering, “why? what is it promising?” Maybe I’m too old-fashioned.